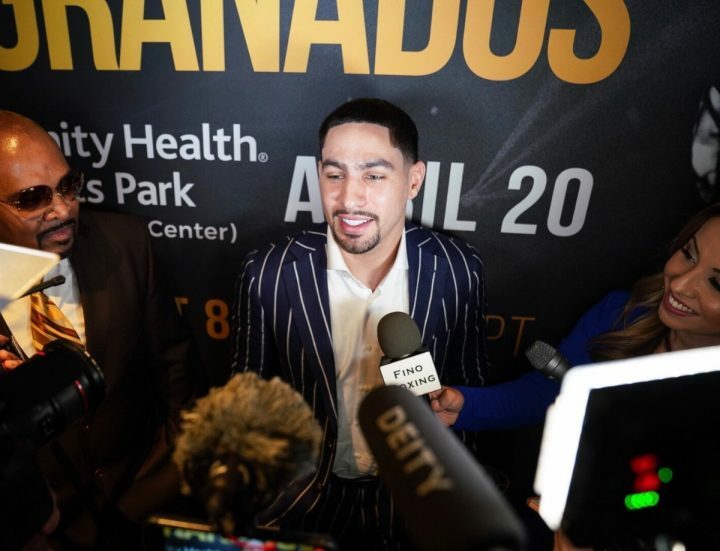 By Chris Williams: Former WBC welterweight champion Danny Garcia says he saw flaws in Errol Spence’s game last Saturday in his fight against lightweight champion Mikey Garcia that he can take advantage of when the two face each other in the future. Surprisingly, Danny, 31, isn’t calling Spence out despite seeing flaws in his game that he believes he can exploit when the time comes. Garcia says other top welterweights will now want to fight Spence after seeing his fight with Mikey. In other words, they think Spence is flawed enough for them to beat him. Although Spence (25-0, 21 KOs) easily retained his IBF welterweight title in beating Mikey (39-1, 30 KOs) by a one-sided 12 round unanimous decision, Danny doesn’t rate him as the #1 welterweight in the division. Garcia doesn’t say who he feels is the #1 welterweight, but it obviously can’t be him given that he’s lost two out of his last three fights. “It was two good fighters going at it, but the bigger guy beat the smaller guy. That’s how I took of it,” Danny Garcia said to Fighthub in remarking on his thoughts about last Saturday’s fight between Spence and Mikey. “I don’t think you can claim him #1 welterweight off that victory. Mikey Garcia is a good fighter, but he’s never fought at welterweight one day in his career,” Danny Garcia said. “I think he can because Spence only put it on him in one round in the 10th where he put it on him real bad,” Danny said when asked if Mikey Garcia can come back from this loss and ever be the fighter he was before. “But other than that, I think Mikey held his own. He never got knocked down. He never got worried. He didn’t take a lot of bad punishment. I think Spence respected him. I think they respected each other a lot from what I was watching it. I don’t think it’s going to effect him mentally no,” Danny said. Danny Garcia (34-2, 20 KOs) will be fighting next month against Adrian Granados 20-6-2, 14 KOs) on April 20 on Premier Boxing Champions on Fox Sports for the vacant WBC Silver Welterweight Title at the Dignity Health Sports Park in Carson, California. Some fans feel that it was a moral victory for Mikey, 31, just to go the full 12 rounds with Spence, as he can say that he wasn’t knocked out by the guy that is considered to be the best welterweight in the division. Never mind the fact that Spence spent the first eight rounds just boxing Mikey from the outside, and he only fought hard in the ninth round. It was the same type of performance from Spence in his fight against Lamont Peterson. Spence only really turned it on in one of the seven rounds of the fight last year. Spence had Peterson on the verge of a knockout in the fifth round when he turned it up a notch. But after that, Spence backed off and boxed Peterson for the next two rounds until his corner pulled him out of the fight. Spence is going to have to stay engaged if he wants to press some of the better fighters out of there. He’s not going to be able to knockout guys like Terence Crawford if he only fights hard for one round. If Spence fights like that, he’s going to be taking a risk of having the fight go to the scorecards, and anything can happen when it comes to the judges. “I hope he didn’t go into the fight thinking, ‘If I just go 12, I win,'” Danny said about Mikey. It sure seemed like Mikey was treating his loss like it was a moral victory after the fight. He seemed product to have gone the full 12 rounds with Spence. Errol probably didn’t realize at the time that he would seen in a negative light by a lot of boxing fans if he failed to KO Mikey due to him being so much smaller than him. Just toying with him, and boxing him isn’t enough. Spence needed to show the fans what a larger fighter does to a smaller fighter. Spence fought lazily, and with too much patience. By not going after Mikey from round one, Spence now has guys like Danny Garcia saying he saw flaws in his game that he can take advantage of. Obviously, there’s very unlikely as Danny is a struggling fighter at this point, and his brief period of time being a relevant fighter at 147 is about to expire after he loses a couple of more times. Danny needs to move back down to 140 because he can’t cut it at welterweight. “I think for a lot of other welterweights, after watching the fight another welterweight might think there’s a fight they want against Spence,” Danny said. Most of the elite welterweights are small like 5’7″ Keith Thurman, 5’7″ Shawn Porter and 5’8″ Terence Crawford. Those guys are probably much too small to compete with Spence. They might think they see something that they can take advantage of, but the reality is they’ll be in the same position the 5’6″ Mikey was in with them being too tiny to compete. Perhaps the reason reason why the other top welterweights will want to fight Spence now is he bring them big paydays in terms of pay-per-view money and ticket sales. There’s money to be made for them if they fight Spence. You’re not going to get that money fighting the regular contenders. Now that Floyd Mayweather Jr. is retired, there are only two popular welterweights in the division right now, Pacquiao and Spence. The top welterweights now don’t have much choice in who they need to go after if they want a nice payday. It’s either Spence or Pacquiao, and getting a fight the Filipino star isn’t easy. The 40-year-old Pacquiao is selective now that he’s nearing retirement. “Oh yeah, definitely,” Danny said when asked if he saw something from Spence that he can take advantage of in a fight against him in the future. “I seen a lot of things. Mikey did a great job. Mikey held his distance well. Mikey threw punches and landed punches. He just wasn’t strong enough,” Danny said.